No way, Jose: Atlantic’s Third Major Atlantic Hurricane of 2017 – Coercion Code – "Dark Times are upon us"
Hurricane Jose reached Category 3 strength at 5:00 pm EDT, the third storm in a row to do so, after Harvey and Irma. Jose’s winds were up to 120 mph in the 8:00 pm EDT advisory, which placed the center about 540 miles east of the Leeward Islands. Tracking west-northwest, Jose was located only about 80 miles south of where Irma prowled just three days ago. Typically, such a path would encounter cold water churned up by the preceding hurricane, but it appears that Jose’s small core is staying just south of the cold wake left by Irma. Jose has also shrugged off moderate wind shear of around 15 knots, with the help of warm SSTs of around 29°C (84°F) and a fairly moist atmosphere (mid-level relative humidity close to 60%). Jose’s rapid deepening should come to an end shortly, as its west-northwest path will soon intersect Irma’s west-southwest path. By late Friday, Jose will be directly over the cold wake left by Irma, where SSTs over a small area have dropped below the 26°C threshold for sustaining tropical cyclones. This wake may not be reflected yet in all forecast models. Jose will also be ingesting some dry air by late Friday into Saturday, so it is likely to peak at its current Category 3 strength. 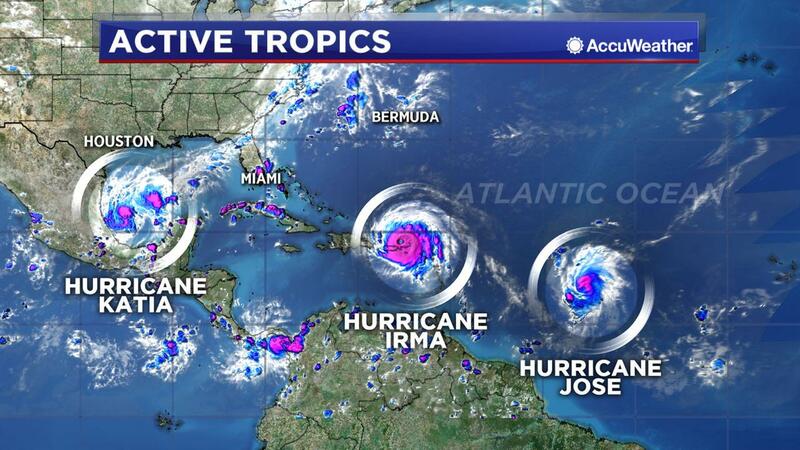 Above: VIIRS image of three hurricanes in the Atlantic on Thursday, September 7, 2017: Cat 1 Katia (left), Cat 5 Irma (center), and Cat 3 Jose (right.) Image credit: NASA. Still, in a one-two punch horrifying to ponder, Jose may spend Saturday rolling across some of the northern Leeward Islands hardest hit by Irma earlier this week. Hurricane watches are in effect for Antigua, Barbuda, and St. Martin/Sint Maarten. We can hope that the 12Z Thursday European model ensemble runs are correct, as they generally keep Jose northeast of the islands, whereas a good fraction of GFS ensemble runs bring the hurricane over or very near the islands. The official NHC track, midway between the operational Euro and GFS models, brings Jose within about 50 miles of Barbuda, which would probably be far enough to avoid major impacts from this compact hurricane. Models agree that Jose will arc northwestward from that point, slowing to a crawl well southwest of Bermuda by midweek. Long-range models remain in wild disagreement on Jose’s eventual fate: the 12Z Thursday European ensemble runs favor an eventual west or north motion, while most of the GFS ensemble runs take Jose northeastward. Figure 5. Enhanced infrared image of Hurricane Jose as of 9:45 pm EDT Thursday, September 7, 2017. The northern Leeward Islands are outlined at far left. Image credit: NOAA/NESDIS. However others are suggesting Jose has quickly strengthened into a high-end Category 4 hurricane in the central Atlantic. Hurricane warnings and tropical storm watches and warnings have been issued for parts of northern Leeward Islands. This may occur just days after the devastation from Irma. Jose is a Category 4 hurricane, with maximum sustained winds of 155 mph, in the central Atlantic Ocean – the third major hurricane of the 2017 season – and will threaten portions of the Leeward Islands this weekend, just days after Hurricane Irma ransacked parts of the region. Jose is currently located just over 250 miles east-southeast of the northern Leeward Islands and is moving west-northwest at 10 to 15 mph. 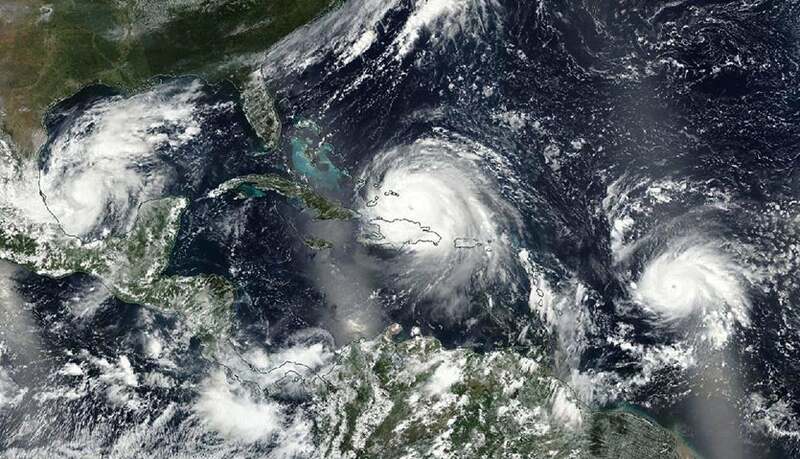 Recent data from an Air Force Hurricane Hunter plane indicated that maximum sustained winds have increased to 155 mph – a high-end Category 4 hurricane. Some fluctuations in intensity are possible over the next day or so, according to the National Hurricane Center, but the general trend is for slow weakening. Beginning this weekend, an increase in wind shear, associated with the outflow of Hurricane Irma, should result in some gradual weakening. By the weekend, Jose is expected to slow down and turn northwest. Jose will near the Leeward Islands, including the Irma-battered islands of Barbuda and St. Martin, on Saturday.